Alzheimer’s research is one of the most exciting frontiers of science. I’m optimistic we can alter the course of the disease if we make progress in the development of a better diagnostic. I have found a direct connection between astrocytes and amyloid plaque formation. By Michael Dale Sipes, Jr. Ph.D. 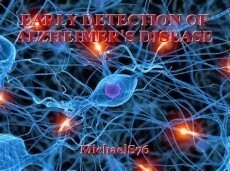 Currently most researchers are focused on glucose metabolism in the brain as a possible cause for Alzheimer's disease. However, in a brain that is glucose deprived, astrocytes generate ketones that can be used by neurons. I think a more precise if not accurate measurement would be to measure the rate of adenosine triphosphate (ATP) production. ATP levels fluctuate depending on brain activity. This may be beneficial in determining abnormal brain activity or neural activity at the molecular level. Calcium, sodium, and potassium ions continuously passed through the membranes of cells, so that neurons can recharge to fire. ATP supplies the energy required for these ions to traverse cell membranes. An imbalance of these ions can cause swelling, damaging cells leading to strokes and possibly contributing to the disease process of both Alzheimer's and Parkinson's disease. I need to further add to my hypothesis regarding ATP and ultimately glial cells. As I mentioned a brain that is glucose deprived, astrocytes in the brain can generate ketones to be used by neurons. At the molecular level. Calcium, sodium, and potassium ions continuously passed through the membranes of cells, so that neurons can recharge to fire. ATP supplies the energy required for these ions to traverse cell membranes. An imbalance of these ions can cause swelling, damaging cells leading to strokes and possibly the development of amyloid plaques. Amyloid plaques appear early in Alzheimer’s and their development is linked to activated astrocytes and microglia. As a consequence of their debris clearing role in response to neurodegeneration, astrocytes are capable of accumulating large amounts of neuron deprived amyloid B(1-42) positive material and other neural protein’s. These overburdened astrocytes with the internalized materials eventually lyse, and a radial dispersion of cytoplasmic contents leads to the deposition of a persistent residue in the form of small GFAP-rich astrocytic amyloid plaques. I feel there is a strong connection between the lysis of astrocytes and the AB molecules that constitute the amyloid plaques left behind. Aggregates of soluble oligomers, specifically misfolded oligomers induce other AB molecules to also take on the misfolded oligomeric form which leads to a chain reaction very similar to prion infection. Since these oligomers are toxic to nerve cells, there is a connection between the lysis of astrocytes due to a disturbance in the ATP cycle and the resulting degradation of surrounding nerve cells due to toxic oligomers which result in a pathology similar to a viral infection. This brings me to the importance of measuring calcium, sodium and potassium levels and their relationship to ATP levels and ultimately the development of amyloid plaques caused by astrocyte lysis. The amyloid plaques that accumulate and cause neuronal loss and damage have been reversed to a degree in mice by reducing beta-secretase. I think this may be a promising treatment in the near future along with other advances in the progression and understanding of the disease process. Very informative and interesting piece. Out of curiosity, what are your thoughts on the story of Kris Kristofferson, how struggled with memory problems in recent years and was told he had Alzheimer's disease, but he was misdiagnosed ( for 3 years ) and all along had actually been suffering from the tick-borne illness Lyme disease. I will investigate the case and get back to you, thank you for your kind comments. I am devoted to finding a definitive test for Alziemers in collaboration with other scientist and ultimately a cure. Michael Dale Sipes, Jr., Ph.D.